Hauling pellets is a pain. We’ve got your back. WoodPellets.com was founded because customers were looking for an easier way to get wood pellets to their homes for an honest price. Since then, customers have asked for more ways to get their fuel, and WoodPellets.com delivers! Now, you can place your order online or call our friendly pellet experts, and sit back and relax while we do the heavy lifting for you. 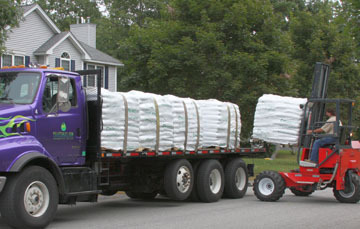 We’ll deliver your pellets to your home, and our drivers will use a forklift to place them where you’d like them. In some areas, we can even move pellets to the back of your garage using a pallet jack. In select areas, we can even deliver loose pellets in bulk. We can even deliver a truckload of fuel for you – direct from the mill. And if you want to try a bag before you buy a ton, we can help you with that too. Request a free sample or stop by one of our local pickup events.